Map It! 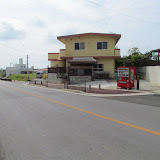 Okinawa: "Kin Town's Hidden Nature Trail"
If you ever driven through Kin Town you will see that it has a lot of good size buildings and houses on both sides of Highway 329. And you would probably never think to find a nature trail right smack in the middle of all those buildings. Well, guess again. I have lived in Kin Town for several years off and on and drove and walked by a particular section of this town so many times that it never occurred to me to scan my peripheral vision. This is common, since I think most of us tend to get tunnel vision walking from point A to point B. But every now and then you get a little surprise. If you look at the album cover you will see a picture of a road, a building, and a Coke machine. Nothing strange about that...until you look closely to the right of the soda machine. Walking past this soda machine, it finally hit me that something seemed a little odd. There was an alley way that seemed to go no where. Then the map sign gave it away. It turns out, that the alley way does go somewhere. It's an entrance way to a nature trail that's very well hidden and tucked in within the town. The trail is only about 200-250 meters in total length, but it is a nice change of scenery. See the photo album. 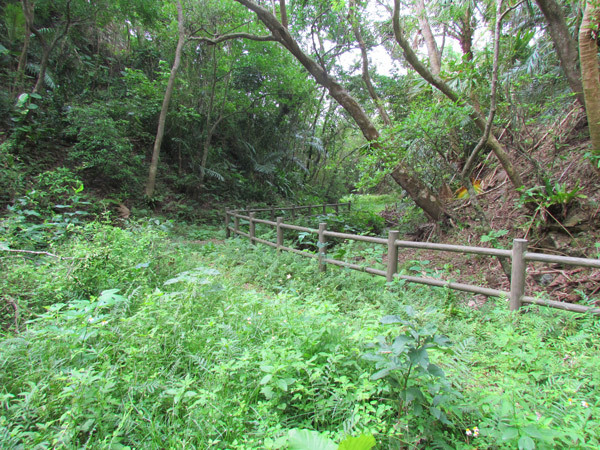 The trail is actually named 'Tiidagaa Forest' Park, which was written in Katankana and Kanji. Tiidagaa, I was told, is Hogen (Okinawan native language) that gives reference to the Sun and River. As you go through the trail you will see wooden floor platforms for viewing, either for educational purposes or praying. Then there are three areas along the trail that have pools of water (almost just like a large puddle). On the sign, they were referred to as a 'well'. On the map (in the photo album), these 'wells' were identified by a 'blue' dot. This may be a small insignificant trail, but if you are really into hole-in-the-wall kinds of stuff then you may find it a small joy walking though this trail. CAUTION. There was a lot of overgrowth on this trail. I recommend wearing pants and long sleeves, especially during certain times of the year. There were a lot of bugs... bugs I have never seen before. If you like bugs then this is the place to go. There were also a lot of mosquitoes. Again, depending on the time of the year, you may see a lot of them. Recommend, using a bug repellant. Wear gloves if you have them. I highly recommend not wearing any sandals either. Additionally bring an umbrella or a walking stick to help brush away possible spider webs and vegetation on the trail. I didn't see any snakes but it something always to be wary of. Don't let any of this scare you. I just wanted you to be prepared. I'm a big believer in 'trail maintenance'. When trails are not maintained, over time, they can disappear and become inaccessible and more importantly, they become unsafe. The more and more people use trails it prevents overgrowth. How to get there. If you look at the map, you will it is not far from Highway 329. You will see two landmarks where you turn off. Once you make the turn, it's only about 400-500 meters away where you will see that Coke Machine. What to bring. Umbrella and/or walking stick, appropriate clothing, water, and a camera. Other places of interest nearby. Kin Kannonji, Kin Watch Tower, Kinjo's Used Goods, Kin Castle Rock, Statue of Oshiro Kozo, Okawa Natural Spring, Richamocha Cafe, The Gold Hall, Statue of Toyoma Kyuzo, Birth Place of Toyoma Kyuzo, Kin Town's History Chronicles, Kin Town's Cherry Blossom Way.